Never trust a dinosaur in the morning. 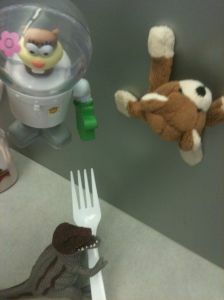 | The Great Adventure's of Cubicle Bear! Never trust a dinosaur in the morning. Spacebear activates his anti-gravitational device and lowers himself to IB’s level. IB (overly nonchalant): Oh, hey Spacebear. It’s been awhile, hasn’t it. I was just hanging out with my new friend Dino here. What have you been up to? Spacebear: Oh, hi IB. Has it been awhile? I’ve hardly noticed. You know what they say, time flies when you’re exploding space bombs. Dino: Holy space bombs, Spacebear! Do you have any left? Spacebear: So, IB, what’s going on with this dinosaur here? Weren’t we afraid of him? IB: He’s docile enough, but he gets a little agitated in the mornings. I blame the coffee fumes. Dino: Ummm…excuse me, guys. Please don’t talk about me like I’m not in the cube. Spacebear: Whoa! Calm down, my belligerent buddy! I would like to invite you to lower your voice, drop the weapon, and step away from the coffee. Maybe we can talk later when you’re feeling a little more reasonable. Spacebear shushes Dino and continues his conversation with IB. Dino starts mumbling to himself and heads off in the opposite direction. « A long overdue return!